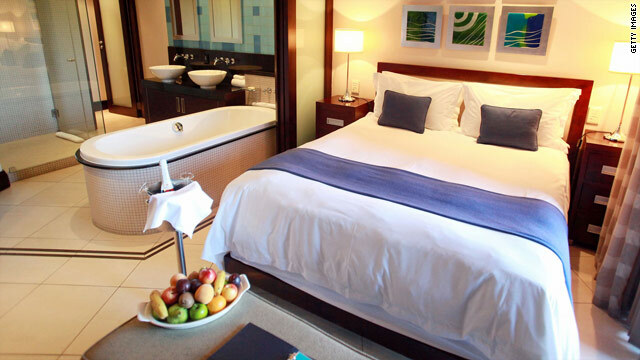 Brand new luxury hotel rooms often go empty, so just-opened properties sometimes have deals. (CNN) -- Business is starting to rebound at many top-end hotels, but if you do your homework, you can still find bargains for that special vacation, experts say. Last year was a great year for hotel deals. The effects of the recession and the number of new properties meant a lot of empty rooms. Luxury hoteliers often offered deep discounts to mitigate their struggles. But in 2010, occupancy has been up more than 13 percent and prices are starting to climb again for individuals wanting to rent a single room, said Jan Freitag, a vice president at Smith Travel Research. "The one-off rate is going up slightly, while the group rate is still down," he said, referring to the latter trend as the "post-AIG effect." Not as many big businesses are booking retreats at expensive resorts, he said. Prices in Las Vegas, Nevada, and Phoenix, Arizona, are still lower because of thousands of new rooms, but New York has recovered "quite nicely," he said. Steve Dumaine, senior director of global merchandising at hotels.com, said the average daily rate of a 4½- to 5-star hotel room is up in the Big Apple, but a lot of people were still finding deals across the country. "We are definitely seeing that people are still trading up into the 5-star hotels," he said. "We look at share of sales by star rating, and we have seen when you compare 2008 to 2010, their share has increased over 80 percent." Freitag believes it is good to plan your luxury vacation now. "The deals you have today are not going to stay as the economy recovers. ... The supply and demand are going to shift to hotels again, and they are going to be back in the driver's seat next year," he said. "Now is the time to take advantage and treat yourself to a vacation you may not otherwise be able to afford." Trying an "impartial search" -- using a website that scans discounters and hotel proprietary sites -- is one of the best things to do when trying to find the lowest rate on a hotel room, said Pauline Frommer, creator of Pauline Frommer's guidebooks. She enthusiastically recommended HotelsCombined, which gives searchers a number of different price options at each property. "And often the differences are startling," she said. She also likes DealBase, a similar website. It also is worth double-checking the hotel's website, she said. Many properties are comping services like massages and meals like breakfast, deals you might get through the hotel but won't find on a travel booking site. If you really want to save money, try to go during the off season. Frommer said the Ritz-Carlton in Rose Hall, Jamaica, for instance, might be more than $400 a night during the peak season and $100 during hurricane season. She said November (before Thanksgiving) was an excellent time to find a bargain at hotels in the Caribbean. Frommer said now is a good time to find deals in Ireland. She said that while writing her guidebook for staying there, she included more luxury hotels because they have lost a lot of business clients. Iceland was another less-expensive destination even before ash from a volcano there hindered European travelers, who have stayed away from the island during the recession. The experts recommended looking at the new City Center in Las Vegas, which was offering "aggressive rates at opening," according to Dumaine. He also said the Trump had rooms for less than $100 to $150. He said people also should consider Chicago, Illinois, where the Ritz-Carlton has had rooms for $250. He also repeated the book-early recommendation. "We have been seeing a lot of book-early deals from hotels over the past few years," Dumaine said. "We have seen a lot of rate compression across the spectrum." Frequent travelers can use points from a loyalty program for free rooms for a 3- or 4-star property and pay the difference to upgrade to a better property, he said.